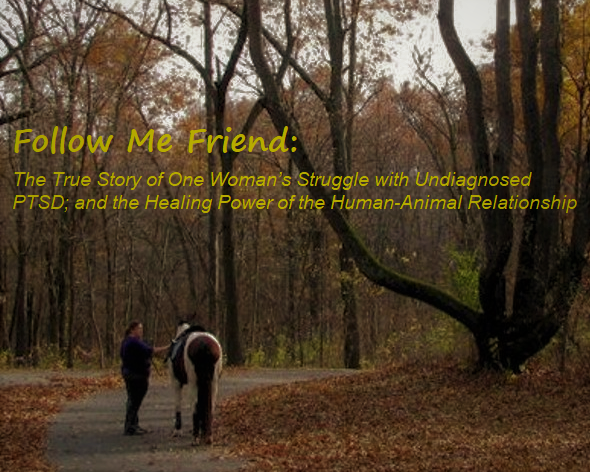 Follow Me Friend is the true story of a young woman dealing with the daily struggles of living with undiagnosed Post Traumatic Stress Disorder (PTSD), and the healing power of the human-animal relationship, told through her experiences suffering the effects of childhood sexual abuse while having no conscious memory of the abuse itself. ﻿For much of my life I thought I was crazy and with good reason. I had a dark secret; a secret so well hidden, I had no conscious recollection of it. What the mind chooses to forget, the body and spirit remember. As I grew from a child into adulthood, I became two very different people -- The happy, content and normal person I presented to the world; and the horrible, self-abusive, self-destructive person I was behind closed doors.